The Eclipse Television Mirror embeds an LCD TV behind a two-way bathroom mirror. When the TV is off, you can't see it at all. Turn it on using the included remote and voil! Watch "American Idol" while flossing. The 15-inch TV Mirror starts at $1,326; add another $150 to $300 for the 20-inch unit. Tired of turning the tap on and off? This "intelligent faucet" from iHouse uses facial recognition to recognize you automatically and adjust the water temperature and flow to your tastes. 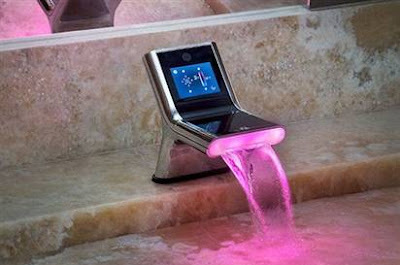 The touchscreen lets you access e-mail, weather forecasts, and your daily schedule while bathing. 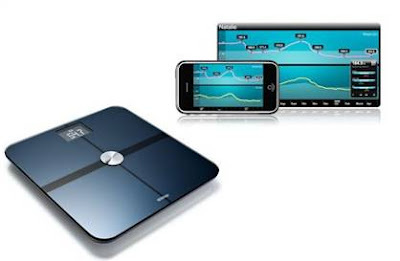 This sleek body scale records your weight, fat mass and body mass index (BMI), and uploads the info to the Internet via Wi-Fi. You can chart weight variations over time via Web browser or a free iPhone app. It's a social scale too, capable of routing your body analysis data to online communities like Facebook or Twitter — if you dare. Price: $168. Are you a sun-worshipper with no time for a tanning salon or the great outdoors? 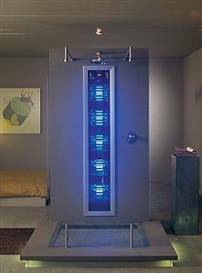 This $11,000 tanning shower allows you to bronze your skin as you wash. Switch on specific tanning lamps to target particularly pale areas where the sun never shines. Yes, your buttocks will be sublime. 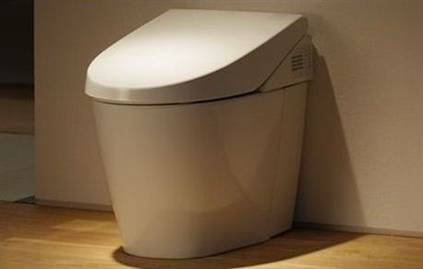 The Japanese are the undisputed masters of toilet tech, and nowhere is their potty prowess more evident than in the Toto Neorest 550, a luxury john that plays sound effects, such as a babbling brook or waves crashing on a beach, to mask your body's natural cacophony. Its lid opens and closes automatically, and the device even has a programmable nightlight. Price: $5,460 to $6,280. Now that's one luxurious loo. 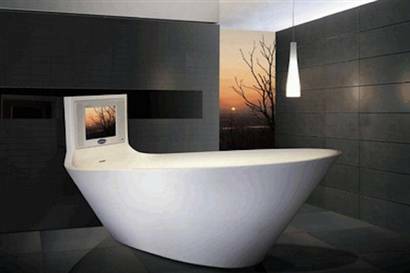 Uber-hip designer Karim Rashid has designed this all-in-one TV-tub unit for the Saturn Bath Company of Korea. Soak your troubles away in this modernistic, white oval tub while catching up on "Real Housewives" of, well, wherever. The LCD TV is waterproof, naturally. I'll bet Zoolander owns one.